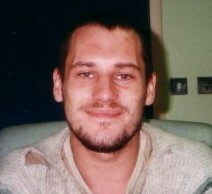 How convenient it is to label someone mentally ill. You seldom have to worry about their rights. Whether legally supported or just socially allowed by way of a quiet acceptance (usually both), a label of mental illness separates you out to a lower and less free class. I know — it’s nothing I haven’t said before but until it changes, it’s not the kind of thing that goes without saying. The Sydney Morning Herald reports that things could be changing for the worse for Australians deemed mentally ill. Again. Australia doesn’t exactly have a good track record in terms of protection and rights for people with perceived mental illness — and frankly anyone interested in preserving their rights to any kind of due process should be concerned. Leading psychiatrists warn that the civil rights of mentally ill people could be severely eroded by plans to extend the length of time patients may be held in locked wards without legal review. The NSW Mental Health Tribunal is poised to introduce a new system which will mean a patient can be detained for up to one month before their case is reviewed by a lawyer. At present someone who is compulsorily detained for emergency psychiatric treatment is reviewed by a magistrate within a week or so of admission. A week “or so” and now a month? Being locked in a hospital is no less a method of incarceration than being locked in a jail. If you’re allowing someone to sit behind a locked door for a month before determining whether there was any legal validity in doing so, the pretense of medicine and the presence of doctors don’t mean a thing. It’s the lock on the door that counts. This is a staggering blow to the idea of basic rights and liberties and aside from those obvious issues, a month of being held anywhere against your will is going to seriously impact your well being, family stability, reputation and of course, your employment and finances. The world keeps going by outside while you’re locked up. “The delay in independent review will mean that people with mental illness, and the public at large, will not be able to have the same degree of confidence that their rights will be protected in our psychiatric hospitals – and for no gain but a minimal dollar saving,” the doctors argue in a recent medical newsletter. “Abuses have occurred in the past … Reducing our vigilance can only increase the possibility of another Chelmsford or ward 10B type scandal”. There is no us and them. This is not just for the “mentally ill” to worry about. If anyone can have their rights stripped away by a label, then everyone should be wary of how easily that label could applied to them. History has taught us many things. Even the strictest of systems can be corrupted and abused, much less a system that leaves this much room for indiscretion and is so imbalanced as to disregard your rights from the start. It’s a crime that it happens and a shame how often we quietly allow it. You may have heard — you should have heard — of a woman named Esmin Green. 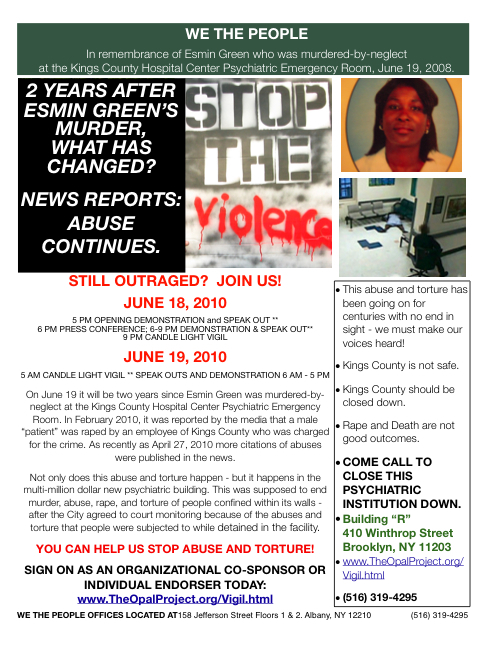 She was involuntarily admitted to the psychiatric emergency room of Kings County Hospital, a place already known for a long record of violence, sexual assault, abuses and neglect. Unfortunately for Ms. Green and countless others, when you are someone who is allowed be shoved into places against your will, you have no say about which places and what standards, if any, are upheld there. Esmin died face down on the floor of the psych ER after being neglected for more than 24 hours. As a telling video of the staff’s complete and ultimately fatal disregard for her was released, they had little choice but to go into public relations overdrive. They agreed to make all kinds of policy changes and rules about accountability as if adhering to policy and truthfully recording their actions was something they were good at. Knowing that if you throw money at a problem people read it as care, they also built a $153 million replacement for the notorious G building where all of these abuses were happening. Not surprisingly, the horrors continue — even under federal monitoring. Kings County’s Building R is little more than a multi-million dollar snake pit. Last year, I attended a vigil in Esmin’s memory and a protest of the hospital’s neglect and continued abuses against people labeled mentally ill. It was organized by We The People and was as successful as we might have hoped, though the work is not done. Survivors of psychiatric abuses had an opportunity to speak out — and what some of these survivors had to say is not to be missed. I heard from several people that have helped inform and shape my approach toward activism and human rights. This year, two years after her death, We The People will not let it drop as the problem clearly continues and I intend to stand with them in protest of a place that, for all their talk and money, is clearly beyond reform. We need to stand in solidarity with those behind locked doors and let the ones with the keys know we’re watching. Come out June 18th – 19th and demand justice, choice and human rights in mental health, voice your disapproval of the current standard of care and show them that there is a growing opposition in the public. Human rights are universal and a diagnosis cannot be allowed to erode that or even worse — invite abuse. When we look back in the light of hindsight at an era that saw basic human and civil rights denied people labeled ill and how many times we’ve collectively turned a blind eye to staggering amounts of abuse, we will look back in disgust. At least I’ll know which side I was on. See below fliers for details and feel free to copy, repost and display them in support of the event. 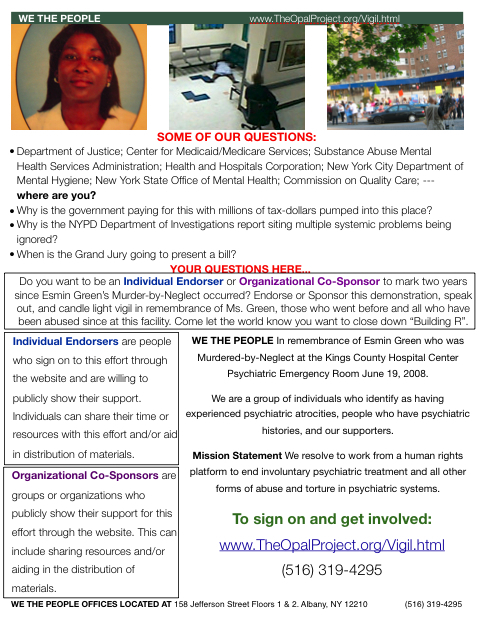 Mental Disability Rights International (MDRI) whose simple slogan is “Disability rights are human rights” has issued a report on the abuses at Judge Rotenberg Center calling on the Special Rapporteur, The Obama Administration and the Department of justice in their effort to put a stop to the establishment’s longstanding abuses against children and adults in their alleged “care”. You may remember my posting about JRC in the past. The abuses that occur there are astounding and I and many others are left wondering how such abuses can carry on without any outside interference from the governing bodies that are supposed to protect all of our citizens — certainly those among us most vulnerable to mistreatment. In its report MDRI rightfully calls this mistreatment nothing short of torture. Washington, DC – April 29, 2010 – Mental Disability Rights International (MDRI) has found children and adults with disabilities tortured and abused at a “special needs” residential facility in Massachusetts and has filed an “urgent appeal” with the United Nations Special Rapporteur on Torture to demand the United States government end the torture immediately. MDRI’s latest report, Torture not Treatment: Electric Shock and Long-Term Restraint in the United States on Children and Adults with Disabilities at the Judge Rotenberg Center (JRC),documents the use of electric shocks on the legs, arms, torsos and soles of feet of people with disabilities – for weeks, months and sometimes years. JRC uses punishments as treatment and US advocates have been trying for decades to close the school and end these practices. The school also uses 4-point restraint boards, tying children to the boards while simultaneously shocking them for hours; mock assaults; food deprivation; shock chairs; isolation and long-term restraint. Residents at JRC are diagnosed with a variety of behavioral, intellectual and psychiatric disabilities such as autism, bi-polar disorder and learning disabilities. MDRI calls on the Special Rapporteur, along with the Obama Administration and the Department of Justice, to end the abuses against people with disabilities at JRC. MDRI is an international human rights and advocacy organization dedicated to the rights protection and full participation in society of people with disabilities worldwide. Help us put an end to the torture of children with disabilities in JRC. I sincerely hope this report and urgent appeal are not falling on deaf ears. MDRI presents a clear opportunity for the system to take a stand on institutional abuse and torture under the pretense of care. We need to stop drawing lines across which we’re willing to allow these things to happen. No perceived mental illness or disability can be allowed to take away our basic human rights. This is their chance to show us that human rights are universal. If they can’t do that, what are they good for? This is a great video created by activist, artist and psychiatric survivor, Leah Harris. I met Leah in Brooklyn at a demonstration and vigil in honor of Esmin Green and in protest of her passing for lack of care in a hospital. Leah immediately impressed me with her outspoken determination and when she’s performing a spoken word piece, she has a gift for getting to the core of what she’s communicating. What I might say in a lengthy rambling post or conversation, she cuts to in a phrase. Leah’s been bringing that sharpness, conciseness and strength to video editing as well lately. In this short video, she shows viewers what the mental health rights movement is to many of us and what the late Judi Chamberlin is to that movement. You’ll notice I didn’t say was. Anyone who has fought as hard for and had such an impact on such a movement that survives them will always be tied to it. Benjamin Franklin once said something to the effect of, “If you are to be remembered long after you die, either write something worth reading or do something worth writing. ” Judi did both. Some day, when we look back on this movement in the same peculiar light of hindsight as we view the fight for black civil rights, women’s rights and gay rights, Judi will stand out as one of its first and strongest figures. In addition to what she did directly and for its own sake, she inspired many — often at times and in places where inspiration was notably absent. I wish I would have been in a position to meet and work alongside her toward our shared purpose. Instead I am blessed to be in the good company of people she affected directly.